As a member of the renowned Flying Doctors Service, Dr. Anne Spoerry treated hundreds of thousands of people across rural Kenya over the span of fifty years, earning herself the cherished nickname “Mama Daktari”—“Mother Doctor.” Yet few knew that what drove her from post-World War II Europe to Africa was a past marked by rebellion, submission, and personal decisions that earned her another nickname—this one sinister—while working as a “doctor” in a Nazi concentration camp. In Full Flight explores the question of whether it is possible to rewrite one’s past by doing good in the present, and takes readers on an extraordinary journey into a dramatic life punctuated by both courage and weakness and driven by a powerful need to atone. John Heminway is an author and award-winning filmmaker who has produced and written more than two hundred documentaries on subjects as varied as travel, brain science, evolution, and natural history. He has won two Emmys, two Peabody Awards, and a duPont-Columbia Award. Most recently, he is known for his exposés of the illicit ivory trade. In Full Flight is his sixth book. Heminway lives in Montana. "Vivid, often riveting…. Heminway captures his subject’s staggeringly complex past as well as the vitality of the continent that became her home in this unflinching and evocative work." "Incredible… An exceptionally compelling contemplation on life’s meaning, the nature of humanity, and whether atonement is achievable… This biography features dramatic elements: a reckoning with Africa, an individual who spent 50 years defying social conventions to save lives, and a secret past. Even so, the primary pleasure of this book is Heminway’s interrogations of his own motives as well as Spoerry’s." "There are no easy answers to glean from this tale of tragedy and atonement... Drawing on journals, long-buried files, and interviews with Spoerry and her friends, Heminway uncovers not only the doctor's heroism and humanitarian efforts in Kenya but also the darker past that led to her emigration from Europe…. [In Full Flight] is an important work that is sure to provoke discussion about wartime choices, moral courage, and whether it is possible to make amends." 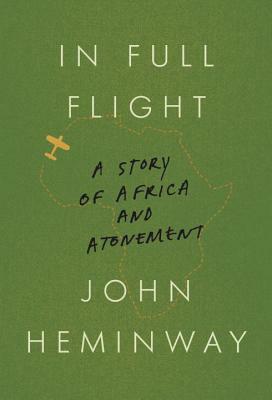 "No one I know has a more spiritual understanding of Africa than John Heminway, and in In Full Flight you are taken into the soul of the continent in a way that will astonish, inspire, and linger. It is a literary safari of the highest order." "A book that movingly celebrates the indomitable human spirit... John Heminway has turned his remarkable investigative skills to unraveling the incredible history of Africa’s famed Dr. Anne Spoerry. Reading more like a novel than a biography, In Full Flight paints a portrait of a courageous woman, haunted by a dark past, who looks to Africa to heal." "An amazing illustration of how complicated a human life can be. Anne Spoerry, the subject of this almost unbelievable tale, was a woman of incredible self-discipline. Most of her friends, myself included, never really knew much about her to the end. An extraordinary, well-written story." "John Heminway’s In Full Flight left me quite literally stunned, not only by the story itself, of a woman whose journey took her from the heart of Nazi darkness to broad, sunlit uplands of Africa, but also by the author’s extraordinary journalistic gifts. A book to chill and warm the human heart." "In Full Flight proves once again that true stories are the best. No novelist could invent a more intriguing, haunted heroine than Dr. Anne Spoerry—or a life that would take her from disgrace in a Nazi concentration camp to redemption on the wild plains of Africa. John Heminway is an exceptional journalist who also happens to be a thoughtful and compelling writer." "A splendid, provocative, page-turning tale of a Swiss woman who lived two lives: a WWII war criminal during her internment at Ravensbrück, and a full fledged doctor-savior who, flying her own plane, tended to thousands of villagers and pastoralists across east Africa driven by her broken Hippocratic oath, deep compassion, and a ferocious lust for atonement." "Damn, what a subtle, engrossing, harrowing, elegantly written, and probing book. Anne Spoerry is an unforgettable character, a figure of deep moral ambiguity, and John Heminway understands—as Conrad knew—that the real heart of darkness lies within the human breast."